Steve Ford is a down but not out L.A based Private Investigator whose professional and personal worlds collide after his loving pet Buddy is stolen by a notorious gang. A series of crazy circumstances find him doing the gang’s bidding, while being chased by two vengeful Samoan brothers, a loan shark’s goons, and a few other shady characters. They say a dog is a man’s best friend, and Steve shows how far a man will go to be reunited with him. Either Venice Beach in L.A. is a tiny place at the ocean. Or Bruce Willis knows how to move around with incredibly speed. Because the pace at which he pops up in different places is impressive. Fortunately, it’s not full naked on a skateboard the whole time, because that wasn’t a pretty sight. Just like Arnold Schwarzenegger in “Aftermath“, you can see that aging is getting to Bruce Willis. The result is a set of not so tight buttocks. But they are still muscular enough to clamp a revolver in between. Again there’s a dog involved. 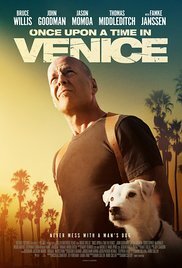 “Once upon a time in Venice” is a fairly chaotic story where Steve Ford (Bruce Willis), a private detective who solves ludicrous cases most of the time, gets into a lot of trouble when his dog is being stolen by a local gang. Well, John Wick also shot a bunch of gangsters, after they’ve killed his cute little dog. Proof that you should be careful with dog owners. Before Steve realizes it, he needs to fullfill a few assignments to get his dog back. And trust me, a few of those clients look and act absolutely weird. Despite the satirical mood and some highly amusing characters, the whole story isn’t so impressive. Perhaps it was their intention to make an action comedy, but unfortunately the humorous section was quite disappointing and the action part was limited to a number of skirmishes in the end. To be honest, for once, it’s the enthusiasm of Bruce Willis‘s acting that surprised me. In this movie he doesn’t have that uninterested, tired look and nonchalant attitude as he demonstrated before in a few meaningless films. No, once again you could see him appear with his sympathetic, cheerful look while quoting a few one-liners (though they weren’t really witty). This time it felt as if the paycheck wasn’t the main reason for him to participate in this film. The movie poster reminded me immediately of “The Last Boy Scout“. Come to think of it. Wasn’t he planning to buy a dog for his wife in that movie as well? In all probability a coincidence, I guess. Give John Goodman a cigar. Personally I thought John Goodman (Did he loose weight?) stole the show as Steve’s sidekick. His character looks as if he came straight out of “The Big Lebowski“. A peculiar person and owner of a surf shop whose life is riding a fatalistic rollercoaster because of a messy divorce. But the moment he takes part in the action, as Steve’s partner, he’s as happy as a pig in shoes. The surprised look on his face when he sees Steve’s weapon arsenal, is comparable to his overall performance. It’s as if John Goodman didn’t really know why he was in this movie in the first place. Which made it even more funny. Also Jason Momoa (last seen in “Bad Batch” playing an interesting role) did a great job. On the one hand, a lame persiflage-like part. But because it was greatly exaggerated, it became funny as well. And in between, you’ll see a Jewish real estate owner called “Lew the Jew” (Adam Goldberg), who’s troubled by a fanatic graffiti artist who paints explicit pornographic artwork on his buildings. Kind of a relief to see Bruce Willis enjoying himself. I often felt embarrassed about certain scenes while watching this movie. On the one hand, it was fun to see Bruce Willis acting with visible pleasure and without scruples. On the other hand, there were also some awkward performances to admire and the humorous level wasn’t comparable to what Willis had done in the past. Perhaps it was a movie unworthy of such an actor as Bruce Willis, but compared to the other monstrosities he appeared in in the recent past, this comedy/action movie was still a little bit of an improvement. One of the better film reviews that I have seen.